Any good star wars battlefront 2 settings games always been janky for me but want to try and get back into it would love some feedback! I remember having the first star wars battlefront video game. The aiming mechanics were so horrible I never played it again after my first match. Is it the same in battlefront 2? What if I tell you I find out a tweak to make aim assist bubble very easy to get in and get out. It solves the janky issues. I play this game since launch, spent countless hours trying everything to make it work with aim assist and I found a solution. You will never read this kind of statements from me but: it is P-E-R-F-E-C-T.
Hmm @antithesis. I recently just got into battlefront 2 after a long break. I can’t seem to find our game pack for titan 2. I’m interested in your method of breaking in and out of the bubble mostly cuz I play heavy and he seems pretty lit. I'm going to be playing both battlefronts for the first time soon. How are the STs without curves or cronus enhancements? I recall the Jack Frags XIM review a while back where with the basic ST he said it was awesome, so surprised to hear people complaining about jankiness. I think he might refer to the weapons gameplay, if not I completely disagree. EA Battlefront 2015 is the best ST I had use for XIM4 and now APEX. Is my gold standard. That game is 70% HIP fire, the AA slow down was very subtle and clean. When aiming down sights you get mild auto lock on that doesn't stunt your cross-hair and you keep free micro aim on the aim assist bubble, very easy to cut out of it. In short you have Aim Assist, soft helpful and fully controllable. Absolutely highly recommended, just play it as Fortnite (on 3rd person) not like Battlefield (1st person) is very frenetic shooter, with very low time to kill. EA Battlefont II 2017, different history. The tracking 1:1 is perfect like PC. For XIM: aim assist slow-down is very strong, feels like losing 60% of your sensitivity unexpectedly when aiming a target. Aim assist lock-on is very magnetic and strong works like an aimbot. -wait is not a good thing: once you lock-on to target you get paralyze, can't move the cross-hairs for a second (ADS stun) due the Aim Assist algorithm in the game gets confuse. After that, micro-movement inside of the aim assist bubble is very very sluggish. If you lock-on to the trunk and move to the head... after a stun, you will need to move your mouse a lot. Dreadful for XIM users. When leaving a target you fight against the magnetic pull the aim assist bubble has. I struggle using AA for 9 months, until I got tired and play no AA at all; kept playing I was doing a lot better but no as good like on the first Battlefront where the AA worked to my favor. I came back to the game recently, set a goal to make this Aim Assist work. Tried XIM4 SteadyAim3 Firmware and slowdown was highly reduced. Work my way to replicate it on XIM APEX. After trying all the syncs, and many Steady Aim values and testing back and forth between PS4's I got a value on XIM APEX SA = XIM4 SA3. Similar movement inside the aim assist bubble, but the ADS stun remained, boost, curves nothing worked. Then, learning from other games, I tried an unofficial/unsupported approach for ST use and voilà! ADS stun was completely gone. Now I have a Aim Assist without stun, stutter or jank, a very subtle slow-down, PERFECT. I have full control of my cross-hairs great micro-aim, and a little help of AA which is easy to get in and out of the aim assist bubble, is not intrusive, allows snapping into targets and no turn limit issues at all. 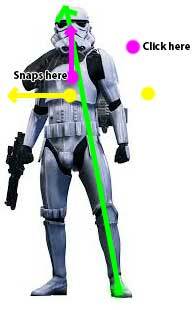 @alanmcgregor would you be so kind as to share the steady aim values and any other Apex set up advice you've done to optimize Battlefront 2? By the way, here's the video I was referring to, Battlefront part starts at 9:17. But the game has been discounted to the cost of a beer! The campaign alone is worth that. For PSN they also give you Battlefront 2015 with all the DLCs. Both pretty good games for XIM. Battlefront II might required a tweaking like any other game on XIM.